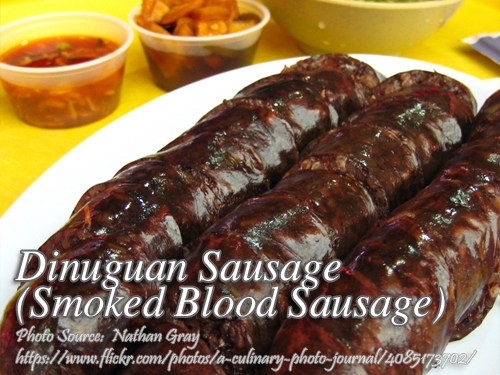 Blood sausage or blood pudding is not common among Philippine cuisine. Only dinuguan or pork blood stew is I think can be considered an authentic Filipino dish and one of the favorite Filipino dishes that is made from pork blood and internal organs. Countries that has blood sausages in their cuisine are Korea, the Korean Blood sausage, Vietnamese blood sausage and in Europe, the German Blutwurst, Boudin in France, and other variants from different countries in Europe. I think what makes this blood sausage different from other countries version is the addition of patis, sukang Iloko and brown sugar. Prepare the spices. Mince garlic and onion if you haven't done it yet. Mince pork fat and set aside. Mix all the the prepared ingredients, except the pork blood together with the ground pork. Then add the pork blood and mix it well. Let the mixture marinade for 1 to 2 hours. Add 1 cup of flour before stuffing the mixture in the sausage casing. Stuff sausage casing with the dinuguan/longganisa mixture. If you already have a mechanical sausage stuffer, the better, otherwise you can research the internet to stuff the sausage casing without the sausage stuffer. Hang sausages in a cool shaded area and let it dry for at least 2 hours. Smoke sausages for at least 1 to 2 hours. Saute some onions then add about 1 cup of water. Add bay leaves, green chilies and then the sausages. Simmer until the liquid evaporates. Fry sausages on their own fat until the skin is crispy brown. Do you cook the dinuguan coat before simmering? My sausage keeps breaking. Why? Hi Carmela, do you mean to say the sausage casing? you don’t have to cook it before simmering. Have you smoked the sausage and hang it to dry? If it still breaks, maybe you need to lessen the stuffing in the casing.